The 7300 Series closers offer modern styling for a new era of safe and reliable door control. 7300 Series, fixed spring sizes 2–5. Non-handed for regular, top jamb, and parallel arm applications. Two noncritical adjusting valves (sweep and latch) work to provide consistent closing speeds under a wide variety of temperatures. Adjustable backcheck provides cushioning when the door is abusively opened. The 7300 Series is certified to the requirements of ANSI A156.4 Grade 1. 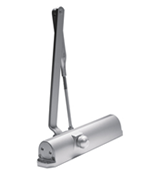 Available with optional self-tapping screws for aluminum door and frame applications (TPK86).